Protect finished artwork from ultraviolet light with this water-thinnable, transparent varnish. It can be used on a wide range of media, including wood, concrete, plaster, stone, pottery, and most synthetic materials. Highly adhesive, it is scratch resistant, weather resistant, and waterproof. 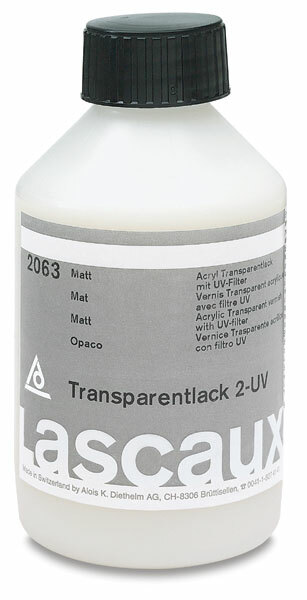 Lascaux UV Varnish is a good choice for adding a gloss or matte protective coating to objects, paintings, and wood surfaces — especially those that have been painted with Lascaux's acrylic colors.